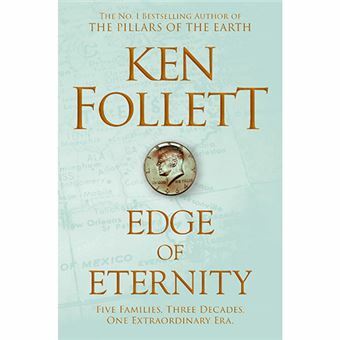 Edge of Eternity is the epic, final novel in Ken Follett's captivating and hugely ambitious Century trilogy. On its own or read in sequence with Fall of Giants and Winter of the World, this is an irresistible and spellbinding epic about the fight for personal freedom set during the Cold War. A FIGHT AGAINST INJUSTICE 1961, and in the United States George Jakes, a bright young lawyer in the Kennedy administration and fierce supporter of the civil rights movement, boards a Greyhound bus in Washington with Verena, an employee of Martin Luther King whom he is in love with, to protest against segregation. A RISING TIDE OF DANGER In East Germany, teacher Rebecca Hoffmann finds her entire life has been a lie as she is targeted by the secret police, even as her younger brother, Walli, dreams of escape across the Berlin Wall to Britain. In Russia, activist Tania Dvorkin narrowly evades capture for producing an illegal news-sheet, her actions all the more perilous because her brother, Dimka, is an emerging star of the Communist Party. A COLD WAR THAT COULD ELIMINATE THE WORLD FOREVER In a sweeping tale that began in 1911, the descendants of five families will now find their true destiny as they fight for their individual freedom in a world facing the mightiest clash of superpowers it has ever seen.